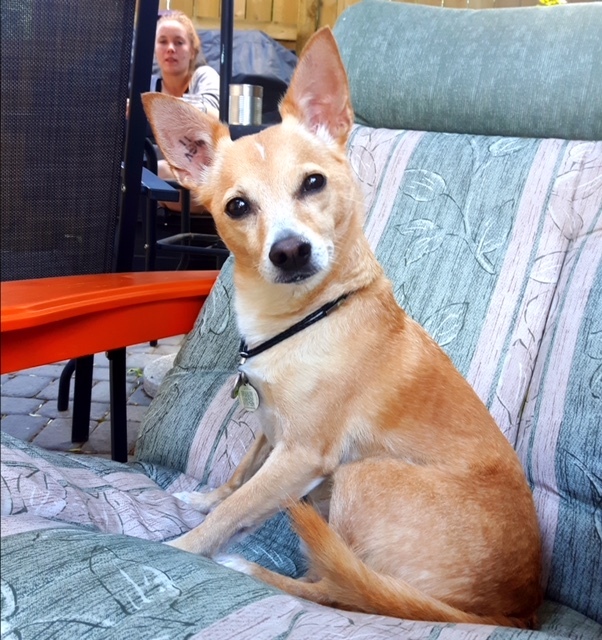 In fact, Dioji is the leader of his little pack, which includes 3 younger adopted chihuahua mixes, who all together weigh in at a whopping 45 pounds. “They make one medium-sized dog,” jokes Jill, who has had Dioji the longest but just couldn’t stop herself from rescuing a few more pups over the last decade. In all, the four dogs have been together for six years, and they rely on Dioji to keep them calm – especially his brother and best friend Mr. Boo, who has severe medical problems and brain damage. That’s why they were all so worried when Dioji started isolating himself from the others. From her years of rescuing and fostering dogs, Jill knew that he was likely in pain and started getting more and more concerned with his symptoms. After examining him the vet told Jill the bad news. He had cracked a tooth and needed surgery as soon as possible; the root of the tooth was exposed, causing him a great deal of pain. He also had a growth on his mouth that needed to be removed and biopsied. Sadly, too many pet lovers in Alberta face similar situations where they cannot afford the necessary medical procedures for their furry family members. Pets are often given up or euthanized if owners cannot find a way to raise the funds required. Luckily the growing public awareness about Tails of Help in Alberta meant that one of Jill’s online contacts knew about and recommended the organization to her. She looked us up online and right away emailed her veterinarian, who filed an application on Dioji’s behalf. In just two days the funding came through, and Jill was left with a much smaller (and more manageable) portion of the expense. “It was incredible and made me feel relief because I knew he was in so much pain,” says Jill. Dioji’s surgery was a success, and the biopsy results for the growth in his mouth came back negative. However, going home in the middle of a record-breaking heatwave, with an influx of wildfire smoke and ash, did not exactly make for an easy recovery. After a few rough days though, Dioji started coming around back to his old self. Dioji and pals ready for some holiday fun! “It’s a miracle that this all fell into place for me, or for Dioji really,” says a grateful and relieved Jill, whose dogs clearly mean a lot to her.